On view at Galerie EIGEN+ART in Leipzig is an exhibition of large scale paintings by German surrealist artist Neo Rauch, entitled Gespenster, which translates as “Ghosts.” Continuing his signature techniques of surrealist manipulation and alteration of classic communist propaganda imagery and pastoral idylls, the show is a strong addition to Rauch’s already substantial body of work. These new paintings portray lively scenes, composed of several different “snapshots,” painted with bright colors while giving off a muted red-brown undertone. The colors emphasize the characters’ clothing, and the skies suggest a sunset or the end of a thunderstorm, with the sun often barely visible. 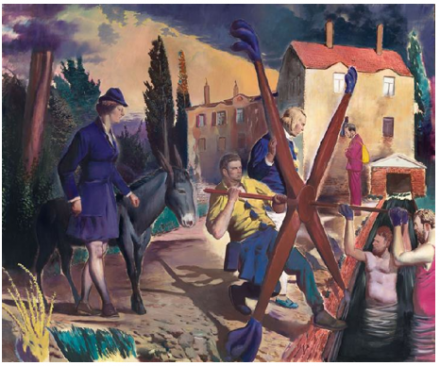 In the majority of Rauch’s paintings, he composes several scenes within the frame of one picture, giving the resultant parallel narratives deeper meaning. The scenes are overlaid on top of each other, causing the viewer to spend time looking past one narrative and into the others. Characters disappear into landscapes, float within the hands of others, and turn their heads back into larger scenes. 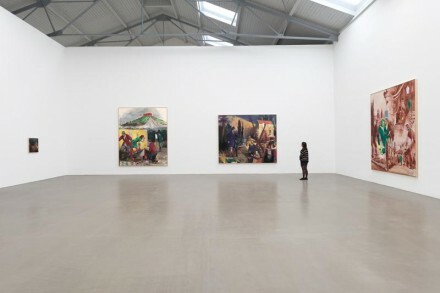 Rauch’s pictures within pictures reflect Rauch’s own artistic process, as he often uses the same character of a sculptor or painter – perhaps his own portrait – in several places within the same work. In Das Bannende (The Spell Caster), for example, a kneeling artist is painting a sculpture which is in the background to another artist’s point of view. This repetition of images of sculpture and artist with several planes causes the viewers themselves to spend time learning the narratives he has created. The eye is guided from one side to another as the viewers sink deeper into the work over time. 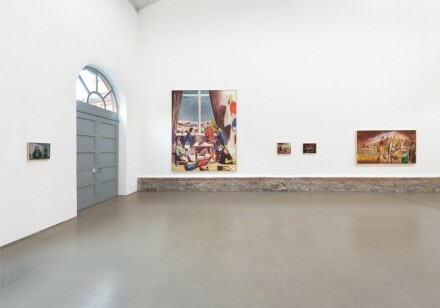 Smaller scale works are also included in this exhibition, which incorporate smaller brushstrokes and softer, more intricately drawn scenes represent isolated characters within bleak German landscapes. Compared to the larger more complex images, these feel like potential parts of a larger work. 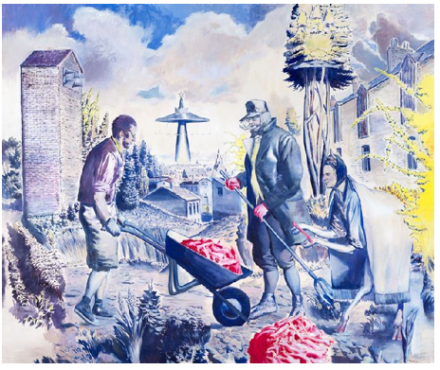 All the while, the artist interjects bizarrely anachronistic images into the work, as in Die Fuhre, where a spaceship or robot seems to have touched down the the background of a classical, European landscape. One farmer’s pantaloons and basketball sneakers are also noteworthy. Neo Rauch was born in 1960 in Leipzig, East Germany, and his surrealist works consistently explore a combination of his own personal history and the politics of industrial alienation. 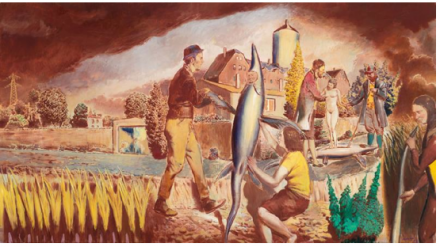 He was influenced by socialist realism, and he himself does not claim to be a surrealist, but instead only influenced by the Surrealist masters such as Giorgio de Chirico and René Magritte. Rauch studied at the Hochschule für Grafik und Buchkunst Leipzig, and he currently lives in Markkleeberg near Leipzig, where he works at the New Leipzig School. 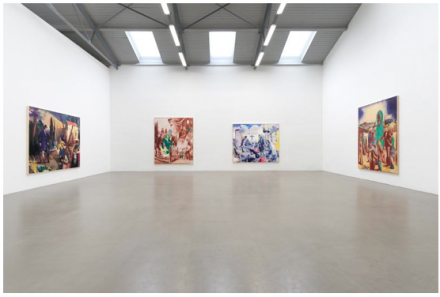 Rauch is represented by Galerie EIGEN+ART Leipzig/Berlin and David Zwirmer in New York. The exhibition “Gespenster” at EIGEN+ART in Leipzig will continue through December 7, 2013. This entry was posted on Wednesday, October 16th, 2013 at 12:00 am	and is filed under Art News. You can follow any responses to this entry through the RSS 2.0 feed. You can leave a response, or trackback from your own site.